There is an opportunity crisis in America. 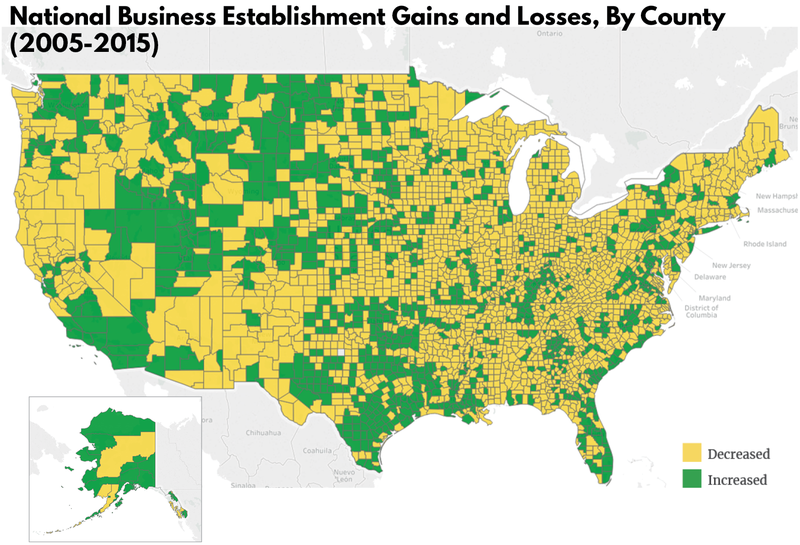 As proof, look no further than the 2,100 counties that lost 200,000 businesses between 2005 and 2015—and 1.2 million private sector jobs along with that. These urban, suburban, and rural areas are home to white, African American, Asian, Hispanic, and Native American families. And they are leaking opportunity. As the divide between high-flying and distressed communities continues to grow, voters will demand solutions to bring more opportunity to more places. Below, we offer a series of options ranging from transforming how entrepreneurs can start and grow businesses where they live to better connecting every community to the digital economy. Anyone running for nationwide office in 2020 needs to confront the opportunity crisis head on. As a central part of that, policymakers need to make sure that we are investing in places left behind—transforming them and the families that live there. Everyone should be able to earn a good life where they live. Unfortunately, that is simply not possible in too many communities across the country. Voters aren’t feeling economically secure where they live. Our polling asked people whether a 17 year old would have more opportunity if they stayed in their community or moved. By a whopping 24 points, people said a young person would need to move to find opportunity.1 And yet in small towns and rural areas, it’s far worse. By nearly 50 points, they say a young person would need to move to get opportunity. Third Way has also proposed ensuring that entrepreneurs in every state have access to private sector equity investment. Under this proposal, the federal government would grant seed capital to states which can either partner with local venture capital firms or hire their own team to invest money in homegrown entrepreneurs with high-growth potential. Jim Kessler, “How the Concentration of Opportunity Elected Trump.” Third Way, 28 Jun. 2018, Available at: https://www.thirdway.org/report/how-the-concentration-of-opportunity-elected-trump. Accessed 14 Mar. 2019. Ryan Bhandari & David Brown, “The Opportunity Index: Ranking Opportunity in Metropolitan America.” Third Way, 30 Oct. 2018, Available at: https://www.thirdway.org/report/americas-got-talent-venture-capital-needs-to-find-it. Accessed 14 Mar. 2019. Ryan Nunn, Jana Parsons, & Jay Shambaugh, “The Geography of Prosperity.” Place-Based Policies for Shared Economic Growth, Edited by Jay Shambaugh and Ryan Nunn, Brookings Press, September 2018, Pages 29-30. Available online at: http://www.hamiltonproject.org/assets/files/THP_PBP_fullbook_web_1016.pdf. Accessed 14 Mar. 2019. Ryan Nunn, Jana Parsons, & Jay Shambaugh, “The Geography of Prosperity.” Place-Based Policies for Shared Economic Growth, Edited by Jay Shambaugh and Ryan Nunn, Brookings Press, September 2018, Pages 26-29. Available online at: http://www.hamiltonproject.org/assets/files/THP_PBP_fullbook_web_1016.pdf. Accessed 14 Mar. 2019. Kelsey Berkowitz, “Stuck in Place: What Lower Geographic Mobility Means for Economic Opportunity.” Third Way, 28 Jan. 2019, Available at: https://www.thirdway.org/report/stuck-in-place-what-lower-geographic-mobility-means-for-economic-opportunity. Accessed 14 Mar. 2019. Ryan Bhandari, “The Opportunity Bank: A Trillion Dollars in New Small Business Lending.” Third Way, 15 Feb. 2019, Available at: https://www.thirdway.org/report/the-opportunity-bank-a-trillion-dollars-in-new-small-business-lending. Accessed 14 Mar. 2019. “Clyburn, Booker Announce Major Legislation to Fight Poverty in America; New Report Details Success of 10-20-30 Formula.” Press Release, Congressman James E. Clyburn, 3 Oct. 2018, Available at: https://clyburn.house.gov/press-release/clyburn-booker-announce-major-legislation-fight-poverty-america-new-report-details. Accessed 14 Mar. 2019. Kelsey Berkowitz & Gabe Horwitz, “Broadband for All: Connecting Everyone, Everywhere to the Digital Economy.” Third Way, 1 Feb. 2019, Available at: https://www.thirdway.org/report/broadband-for-all-connecting-everyone-everywhere-to-the-digital-economy. Accessed 14 Mar. 2019. Policies for Shared Economic Growth, Edited by Jay Shambaugh and Ryan Nunn, Brookings Press, September 2018, Pages 123-156. Available online at: http://www.hamiltonproject.org/assets/files/THP_PBP_fullbook_web_1016.pdf. Accessed 14 Mar. 2019. “Warren Unveils Historic Legislation to Confront America’s Housing Crisis.” Press Release, Senator Elizabeth Warren, 26 Sep. 2018, Available at: https://www.warren.senate.gov/newsroom/press-releases/warren-unveils-historic-legislation-to-confront-americas-housing-crisis. Accessed 14 Mar. 2019. “A Better Deal: Rebuilding America’s Infrastructure.” Policy Proposal, House Democrats, Available at: https://abetterdeal.democraticleader.gov/the-proposals/creating-jobs-lowering-costs-boosting-local-economies/. Accessed 15 Mar. 2019. Gabe Horwitz, Rachel Minogue, & David Brown, “Unemployment to Reemployment: An Idea to Modernize the Safety Net for the Digital Age.” Third Way, 18 Sep. 2018, Available at: https://www.thirdway.org/report/unemployment-to-reemployment-an-idea-to-modernize-the-safety-net-for-the-digital-age. Accessed 15 Mar. 2019. Morris M. Kleiner, “Reforming Occupational Licensing Policies,” The Hamilton Project, Brookings Institute, Jan. 2015, Available at: http://www.hamiltonproject.org/assets/legacy/files/downloads_and_links/reform_occupational_licensing_policies_kleiner_v4.pdf & Joon Suh & Ben Freeman, “Operation Certification: How to Help Vets Succeed in the New Economy.” Third Way, 29 Sep. 2016, Available at: https://www.thirdway.org/report/operation-certification-how-to-help-vets-succeed-in-the-new-economy. Accessed 15 Mar. 2019. James P. Ziliak, “Restoring Economic Opportunity for ‘The People Left Behind’: Employment Strategies for Rural America.” Expanding Economic Opportunity for More Americans, Edited by Melissa Kearney & Amy Ganz, The Aspen Institute, February 2019, Pages 100-126. Available online at: https://assets.aspeninstitute.org/content/uploads/2019/01/ESG_Report_Expanding-Economic-Opportunity-for-More-Americans.pdf?_ga=2.230787420.2125655437.1550004170-744104356.1549310122. Accessed 15 Mar. 2019. “Examining the Unique Opportunities and Challenges Facing Rural Small Businesses,” Small Business Majority, 12 Feb. 2019, Pages 22-25, Available at: https://smallbusinessmajority.org/sites/default/files/research-reports/Opportunities_and_Challenges_Facing_Rural_Small_Businesses.pdf. Accessed 15 Mar. 2019. Tom Vilsack, “Reconnecting with Rural America,” Democracy: A Journal of Ideas, Winter 2018. No. 47, Available at: https://democracyjournal.org/magazine/47/reconnecting-with-rural-america/. Accessed 15 Mar. 2019.